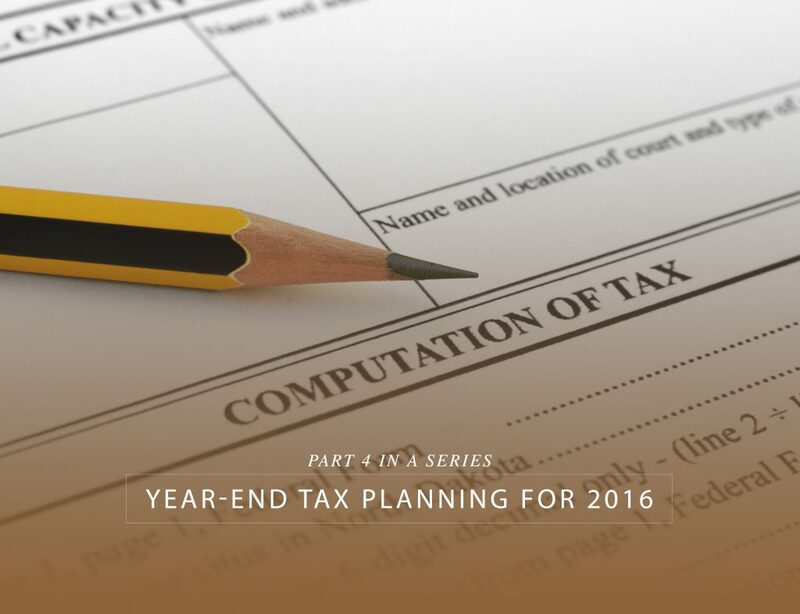 This is the fourth in a series of posts covering year-end tax planning ideas for 2016. Here we’ll discuss a grab bag of ideas covering a few different areas. For individuals, income is usually taxed in the year the income is received, so to the extent you can defer the receipt of a bonus, consulting income, or other self-employment income until 2017, you’ll also defer the taxation of that income until next year. What you cannot do is “turn your back” on income that you have received during the year – for example, if you receive a check from a client on December 23 in payment of an invoice and decide not to deposit the check into your bank account until January 3rd, 2017, that income is still taxable in 2016 because you had control of it in the earlier year. A slightly different situation with the same result arises when, after earning a bonus during the year, your boss asks if you’d like the bonus paid to you in 2016 or 2017 – once the bonus is actually due, it’s taxable on the first day it could become available to you. In this example that would be 2016 since all you had to do would be to ask for the bonus to be paid. A different fact pattern would arise if, before you do the work earning the bonus (maybe the start of the year), you and your boss negotiated on the payment date of the bonus. In that case, the actual date of payment would control, so if you’d agreed to defer the bonus until 2017, that’s when it would be taxable. For self-employed people, similar rules would apply. If you negotiate prior to the work as to when the work will be paid for, then the income is taxed in the year it’s received. If you negotiate after the work has been done, it’s taxed in the earliest year you could have received it. And, as noted above, income is taxed in the year you receive a check, not in the year you deposit the check into the bank. 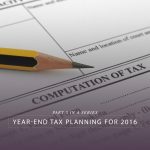 In Part 1 of this series, we talked about planning for charitable contribution deductions, but you should also consider other itemized deductions in your tax planning for the year. Payments for property tax bills, auto license tabs, and, to the extent otherwise deductible, bills for medical expenses or other itemized deductions can be paid before the end of 2016 to secure a deduction for 2016. Mortgage interest deductions are deductible when paid, but remember that it’s best if your claimed deduction matches the amount shown on the Form 1098 that you’ll receive from the lender (otherwise you’ll receive a matching notice from the IRS). So, mail the check or make the e-payment in enough time before year end so that the lender will post the payment to your account before December 31. In our experience, that usually means making the payment at least a couple days before Christmas to allow for year end sluggishness in mail and bank processing. Some deductions are subject to limitations on their deductibility. Medical expenses for example are only deductible to the extent they exceed 10% of your adjusted gross income (special rule for this year – for individuals or couples where one partner is 65 or older, 7.5% of adjusted gross income). Otherwise deductible medical expenses below those thresholds are of no use. If you’re close to the limit, consider incurring medical or dental costs you’d otherwise incur early in 2017 by scheduling for that work to be done earlier to the extent possible to “bunch” those expenses into this year so that you can push your total medical expenses over the minimum. Miscellaneous deductions like unreimbursed employee expenses and investment related expenses are subject to similar thresholds – they are limited to the amounts in excess of 2% of your adjusted gross income. If you get a bill from your investment adviser in December and you are otherwise close to the 2% limitation for miscellaneous deductions, consider making the payment before year end rather than in January to help push your miscellaneous deductions over the limitation for 2016. While Washington state doesn’t have an income tax, if you are subject to income tax in another state because, for example, you have rental property there, consider making the 4th quarter state estimated income tax payment before year end rather than on the January 15th, 2017 due date so that you can take the deduction for 2016. One caveat about bunching – many itemized deductions (miscellaneous deductions and deductions for taxes) are not allowed as deduction in calculating Alternative Minimum Tax. While a detailed explanation of AMT is beyond the scope of this post, be careful about accelerating deductions if you have reason to believe you may be in an AMT situation in 2016. More in the next year-end planning post. As always, if you have questions or comments, please let us know.